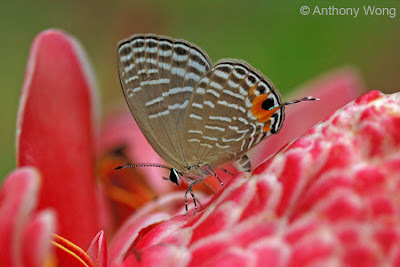 Over the course of last year, in 2008, the hardworking ButterflyCircle members continue to make observations of several butterfly species which have yet to be recorded in the Singapore Butterfly Checklist. A few are still under scrutiny and verification by experts from Malaysia and overseas, and will be announced when their identities are validated in due course. 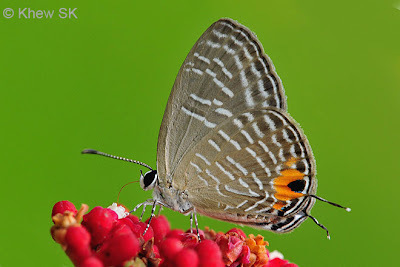 In the meantime, ButterflyCircle is proud to announce the re-discovery of two species of Lycaenids which make them species #286 and #287 for the Singapore Checklist. These two species were originally recorded in the early authors' checklists for Malaysia and Singapore, but in recent years, these species were not observed. A Metallic Caerulean feeds on the flower of Leea rubra. 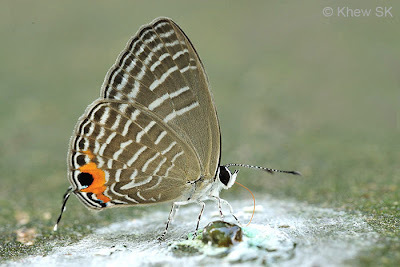 Back in 2008, one of them, the Metallic Caerulean (Jamides alecto ageladas) was observed in numbers at a location towards the northern central part of Singapore. The species was photographed even earlier, but dismissed as the more abundant Common Caerulean (Jamides celeno aelianus). However, after closer scrutiny, the white striations on the hindwing of this species differs from the Common Caerulean. Subsequent sightings of the species was recorded and observations were also made of a female of the species ovipositing on the flowers of the Torch Ginger (Nicolaia elatior), a plant which was not known to be a host plant of the Common Caerulean. Further careful observations were made, as well as documentation of a mating pair of the species. 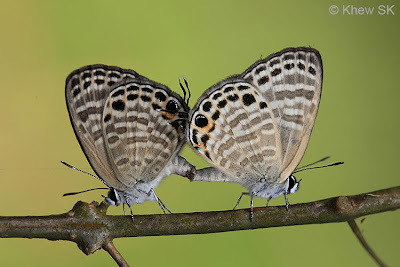 References were carefully checked and consultation made with a foreign expert in Lycaenidae confirmed that the species was indeed the Metallic Caerulean (Jamides alecto ageladas). A male Metallic Caerulean puddles on bird droppings. The Metallic Caerulean, described as the largest species in the elpis subgroup, which is characterised by the post-discal band on the forewing beneath is completely dislocated at vein 3. The male of the species has a black diffuse border on the forewing, expanding to about 1mm at the apex and a series of black marginal spots on the hindwing . In the female, the forewing border extends narrowly along the costa to the base. Also rather unique in this species, is the tornal bands of the hindwing beneath which are interconnected rather than dislocated when compared with the Common Caerulean. The Metallic Caerulean has bright metallic blue uppersides, and grey ground colour on the undersides with the usual white banding. On the hindwing, there is a black centred orange-crowned eyespot at the tornal area, with some additional submarginal orange markings along veins 1b and 4. There is a white-tipped filamentous tail at vein 2 of the hindwing. The species has banded legs and antennae, and the eyes are a solid jet black. It has a rather quick erratic flight, and for most of the day, is active and flies amidst low vegetation and stays close to its host plant, the Torch Ginger. Males tend to stay higher up and chase each other in the bright sunshine. 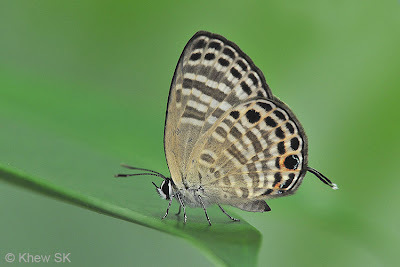 Very often both sexes stop to rest in the shade on the uppersides of leaves and demonstrates the movement of the hindwings and tails in the usual Lycaenid fashion. The 2nd re-discovered species is more characteristic in its physical appearance, and has more distinctive markings with which the species is easily identifiable without much doubt. 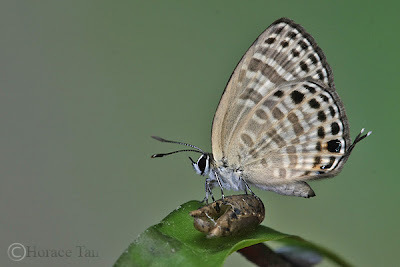 This species, the White FourLine Blue (Nacaduba angusta kerriana) was first spotted towards the end of the year 2008, at an urban park in the Southern Ridges of Singapore. Whilst on a routine weekend outing with some of the regulare members, Sunny Chir stumbled upon a mating pair of the species, where he immediately recognised as something new that he had not seen before. Upon closer scrutiny, it was discovered that, indeed, this species of the Nacaduba has not been recorded in the Singapore Checklist before. The female of the species is so distinct in that a view of the upperside would put the identity of the species beyond any doubt. A member of the pavana group (characterised by the lack of a pair of subbasal lines in the cell of the forewing beneath) of the genus Nacaduba, the White FourLine Blue has a prominent rounded black sub-marginal spot in space 6 of the hindwing. A follow up by ButterflyCircle early stages specialist, Horace Tan, discovered the caterpillars of the White FourLine Blue feeding on the host plant, Entada spiralis and successfully recorded the Early Stages of this newly re-discovered species. The Life History will be documented and featured in a future Blog article. 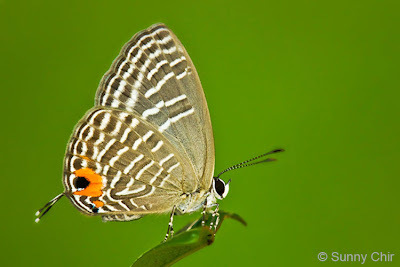 The male White FourLine Blue is purplish blue above with a thin black border, which is about 1mm broad towards the apex. The hindwing is unmarked but with a thin submarginal black border. The hindwing cilia is white. The female has broad black border on the forewing and has a light blue ground colour with diffuse greyish markings on both wings. The underside is greyish, with broad whitish-grey bands and dark grey spaces in between. There is an orange-crowned black spot at the tornal area of the hindwing beneath, with some light bluish-green metallic scaling. There is a filamentous white-tipped tail at vein 2 of the hindwing. 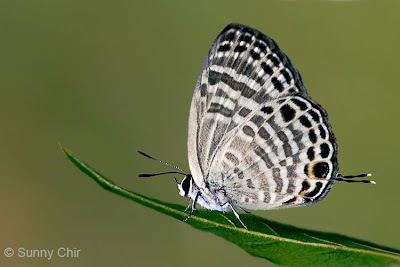 The White Fourline Blue has an erratic but rather weak flight, and prefers to stay under shade, fluttering amongst thick vegetation along the forest edge. Males tend to stay higher up in the forest canopy, and descend lower to find a mate, or to feed. 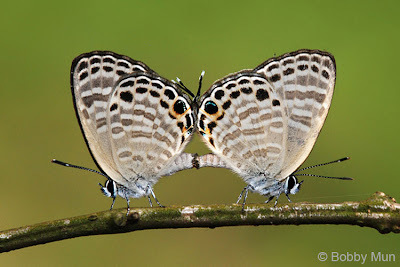 With these two re-discoveries, the Singapore Butterfly Checklist now has 287 species recorded. 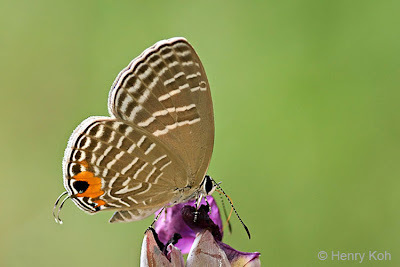 ButterflyCircle, with its bigger number of enthusiasts who are keenly photographing and learning about butterflies, their habitats, early stages, conservation and ecology, it is without doubt that more species will be added to the checklist in the near future. The Butterflies of The Malay Peninsula, A.S. Corbet and H.M. Pendlebury, 4th Edition (1992), Malayan Nature Society.